Nerve damage is no joke. Even something as simple as typing too much can lead to bolts of pain shooting up your arm. The damage from an accident or injury can be even more traumatic. Doctors have known for a while that electrical stimulation can help nerves heal after injuries. Now that observation has led to a futuristic new treatment for nerve damage: implantable gadgets that wrap around damaged nerves, delivering pulses of healing electricity for a set period of time before harmlessly degrading into the body. According to a study published Monday in the journal Nature Medicine, the dime-sized devices comprise biodegradable polymers and magnesium, and they’re controlled and powered by an external transmitter, similarly to an inductive charging mat for a cell phone. The researchers, who hail from Northwestern University and Washington University School of Medicine, say they can adjust the devices’ lifespans from less than a minute to several months by changing the composition of the biodegradable materials. To test whether the gadgets help nerves heal, the research team implanted them around the injured sciatic nerves of 25 adult rats. The more electrical stimulation they gave each rat during the following 10 weeks, the faster the animal recovered its nerve function. 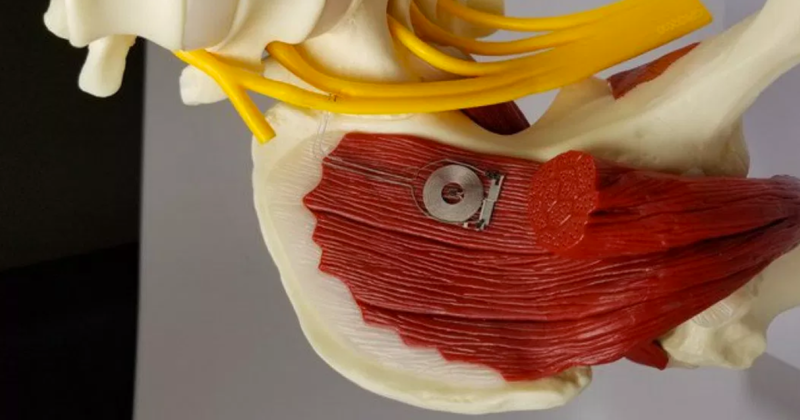 It’s not clear from this initial research whether there’s an ideal amount of electrical stimulation for nerve therapy, however. The researchers didn’t share a timeline for human trials, but they said they’re hopeful that their technique could one day “complement or replace” existing treatments for nerve injuries in people, which frequently rely on prescription painkillers.